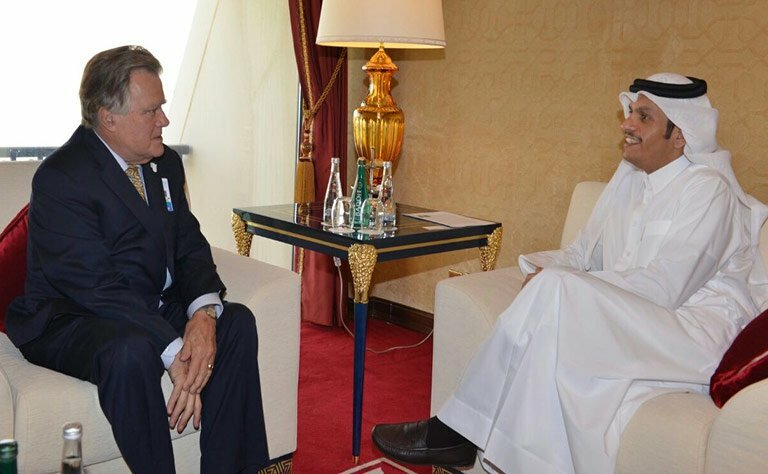 National Council on U.S.-Arab Relations Founding President and CEO, and U.S.-GCC Corporate Cooperation Committee Founder, Board Member, and Secretary Dr. John Duke Anthony, presently in Riyadh, Saudi Arabia to attend the annual GCC summit, spent the past ten days in Doha, Qatar. He did so as leader of a delegation participating in a cultural study visit sponsored by Qatar’s Ministry of Foreign Affairs. 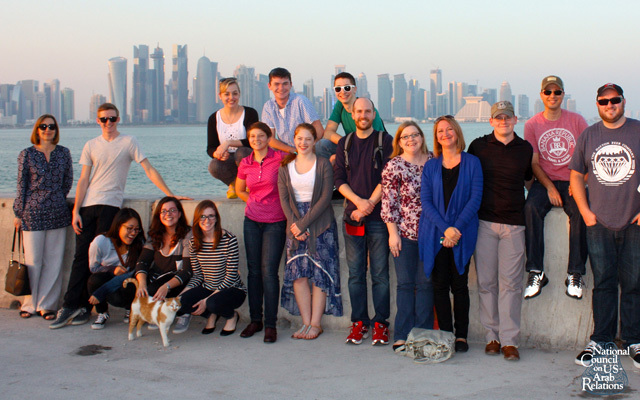 The National Council’s Model Arab League delegation takes in a sunset along the corniche in Doha. The visit was a reward for a delegation of five American faculty advisers and ten U.S. university and armed forces institutions students. The participants were Outstanding Award Winners in the National Council’s Model Arab League Program (MAL), which began in the early 1980s and presently has 38,000 alumni. The Models are conducted for some 2,500 university and secondary school participants 20 times a year at a nearly equal number of U.S. universities. 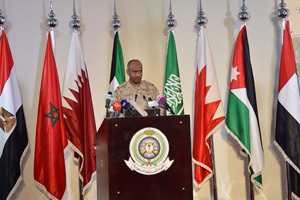 The Council has also helped to establish Model Arab League Programs conducted yearly in Egypt and Saudi Arabia, with Bahrain and Oman in the process of establishing their first-ever programs this year and Qatar’s Gulf Studies Program (see below) intending to organize the first-ever MAL devoted exclusively to the six GCC member countries of Bahrain, Kuwait, Oman, Qatar, Saudi Arabia, and the United Arab Emirates. During their time in Qatar, the delegation members visited and had briefings at the Qatar Foundation, the Museum of Islamic Art, the National Human Rights Committee, Al Jazeera, Katara Cultural Village, the Qatar National Museum, and various branch campuses of blue-ribbon American universities. They also spent an evening with a Qatari family at their farm and sailed on an Arab dhow – a traditional “sundowner” experience, with Doha’s glittering skyline of modernist buildings as the backdrop for photography. Dr. Dunn’s reflections on modernization and development in Qatar based on his fall 2014 visit through the National Council’s Model Arab League Qatar Exchange Fellowship. 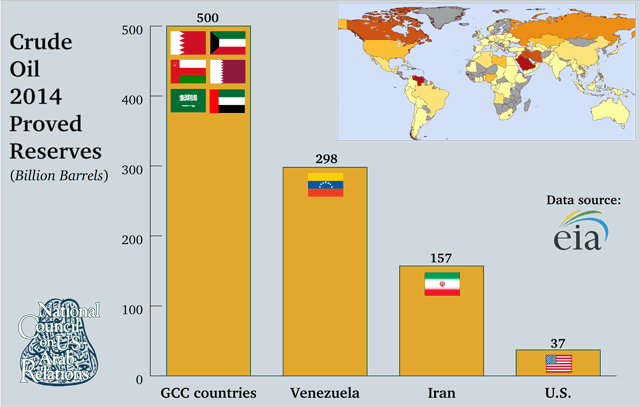 A travelogue and commentary from Dr. Thomas Doleys of Kennesaw State University, who also participated in the Council’s 2014 Model Arab League study visit to Qatar, about the delegation’s experiences. Thoughts from Converse College student Gabriella Chamberland about her experiences as a photographer during the Council’s 2014 Model Arab League study visit to Qatar. An article focusing on “Women in Saudi Arabia” by Converse College student Lauren Ziegler drawn from her experiences on a Council Model Arab League study visit to Saudi Arabia. Recaps from the 2015 Southeast and National MALs where Converse College won top delegation awards. Reviews of three books on the Islamic State group. 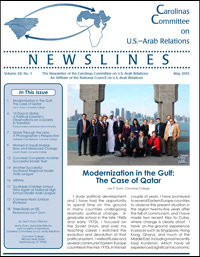 The full issue of CCUSAR’s Spring 2015 NEWSLINES is available for download through the link immediate below. A delegation from the State of Qatar joined the National Council on U.S.-Arab Relations to ring the NASDAQ Stock Market Opening Bell on January 29, 2015. Qatar, host of the 2022 World Cup, shares a robust economic, defense, cultural, and educational relationship with the United States. The Qatari delegation included Sheikh Mohammed Bin Hamad Al-Thani, Special Envoy to His Highness Sheikh Tamim Bin Hamad Bin Khalifa Al Thani; His Excellency Ali Sheriff Al Emadi, Minister of Finance for the State of Qatar; Sheikh Abdullah Bin Saoud Al Thani, Governor of the Qatar Central Bank; Sheikh Abdullah bin Mohammed Al Thani, Chief Executive Officer of the Qatar Investment Authority; and His Excellency Mohammed Bin Jaham Al Kuwari, Ambassador of the State of Qatar to the United States. Mr. Patrick Mancino, Executive Vice President and Director of Development, and Mr. Nabil Sharaf, Public Relations Specialist, represented the National Council on U.S.-Arab Relations.